Muesli is basically a cereal of uncooked oats, nuts and fruit. Sure, you can buy it pre-packaged (like most things), but it’s so easy to make and tastes so much better when you do it yourself. The measurements for this muesli were inspired by Leek Soup, but feel free to customize it any which way. It’s literally impossible to mess up a muesli. I like mine soaked overnight in coconut milk and topped with a sprinkle of cinnamon (and maybe a spoonful of peanut or almond butter if I’m feeling frisky). Hearty yumminess. 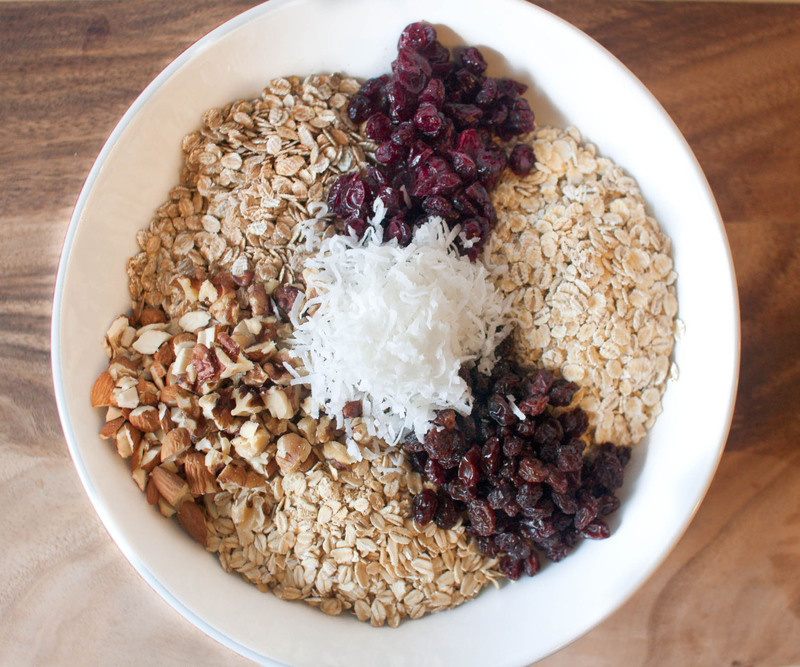 To make the muesli itself, combine all ingredients mentioned above, with the exception of milk and toppings. Store in a covered container. The night before, soak muesli in milk or yogurt and keep in the fridge. I find that a 2:1 ratio of milk/yogurt to muesli works best, but play around with it to find what measurements you like. The next morning, stir the soaked muesli and top with your choice of toppings. Enjoy! I make mine one bowl at a time. I usually use 1/2C of rolled oats, 1/2 C milk, 1/2-1 t. cinnamon (I like my cinnamon), chopped walnuts and 1 t. agave syrup. I usually top it with 1/2 of a banana in the morning. I agree that it is MUCH better soaked overnite, but it can be soaked for just 10 minutes in the morning if I forgot to put it together the night before. Very healthy AND yummy! YUM! Love muesli but I’ve never done it like this before. I’m gonna try it. Thanks! Yum! I like your variations. Thanks so much for linking to my blog! I love more exciting cousins too. This looks so scrumptious and healthy! It is so pretty unstirred with the design. I’ve never made muesli before. This looks really good! Good call on the coconut milk, never thought of adding that to the mix, but that would be really good. I also just tried some coconut milk ice cream the other night, also pretty damn tasty.